We all have mental hang-ups about ourselves, and a lot of times, we use the things that happen to us as evidence that these hang-ups are true. For instance, you might think you’re a bad driver, and then when someone bumps into your car in the parking lot, you just use that as reinforcement for your original thought that whenever you get behind the wheel, something goes wrong. Our brains are prone to punishing us in this way. Unfortunately, it’s something we’re predisposed to. However, this is totally unnecessary and there are ways to stop thinking like this. 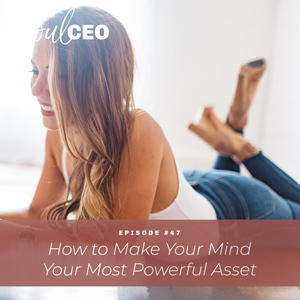 Join me on the podcast this week and discover ways to look at your circumstances more neutrally and not get caught up in indulging your brain on its quest to be right all the freaking time. Once you can control your negative thoughts about your own abilities, you can really start to create your dream life without blaming yourself when things aren’t perfect. If you’re a woman who has already gained momentum in her business and is ready to go to the next level, make sure to check out my new Next Level Mastermind. Visit http://lindseymangocoaching.com/nextlevel to learn more and sign up! Why our brain looks to back up stories we already have in our lives. How to notice when you are looking for evidence to prove your stories true. What you can do to look at things more neutrally. Why as long as you look for evidence of your thoughts, you won’t make progress in your life. Visit http://lindseymangocoaching.com/nextlevel to sign up for my new Next Level Mastermind! Hello, how are you guys? I am so freaking pumped you are here. Thank you for tuning into this week’s episode, whether you’re listening to me over your car speakers, your headphones, maybe you’re at the gym. If you are, you go, girl. If you are – who knows what you’re doing, but thank you for tuning in this week. I’m so excited to be here and I’m so excited to drop my wisdom on you. It’s been so fun. I can’t believe it, I think we’re on episode number 47 and I just cannot believe it. So, for those of you who have been here from day one, thank you. And for those of you who are just tuning in, welcome. I’m so excited you guys are here. I also want to share my gratitude for those of you who share my episodes on your Instagram story. Instagram is one of my favorite social media platforms and I absolutely love when you guys put screen shots of the episode you are tuning into on your Instagram story and tag me. I try to interact with as many of you as humanly possible. So keep doing it. I am honored. I am just so overwhelmed with gratitude and I want to get this podcast in the hands of the people who need it, in the hands of the women who want to have it all and create the lives and businesses of their dreams. And when you share it on your Instagram story, you never know the impact that it could be having and I’m just so grateful and it excites me to think about the one person who maybe saw your story or my story and listened and it completely changed their life or their day or who knows. The ripple effect is amazing, you all. So today, we are going to talk about spell check. You’re probably like, why are we talking about spell check? But I will explain. So, someone was talking about spell check the other day and it connected me with this idea of how our brain filters in formation in our lives. And the reality is, based on the stories that we have – and when I say stories, I mean the beliefs that we have about ourselves, about the world, about the people around us – our brain filters what it sees in accordance with these stories. So, just to clarify that, what I mean is, let’s just say I believe I am a disciplined person. So when I look at my life, I see all the places that I am disciplined. And even if there’s something that I’m not really disciplined in – I’m trying to think of an example. My workouts haven’t been as consistent as they used to be, but I don’t see it as evidence that I’m not disciplined because I believe I’m a disciplined person. And so, it’s not a big deal. It’s not anything. It doesn’t even register in my mind as me, like, oh my gosh, this is evidence that I’m not disciplined. And the crazy thing about our minds, not to get too nerdy on you guys, is our reticular activating system, also known as our RAS, is like this funnel that our brain is receiving information with. And it’s constantly scanning and looking for information that supports what we believe, what we think. It’s kind of like – have you ever gone to a car dealership and decided to buy a certain type of car, and all of a sudden, you see this car everywhere? The reality is that the cars were probably, quote en quote, everywhere, but your brain is now paying attention to it. And so whenever I work with clients, I’m really working with them to make their mind their greatest asset and to recognize how this is happening and when this is happening. And something that I’m constantly saying is that our mind is looking for evidence to support the positive stories and the negative stories that we have, like I said earlier, about our lives, about ourselves, about other people. And when I say that, I think a lot of people think, no I’m not actually looking for evidence, this is just truth. And when I say that, I don’t mean like you are investigating, searching for evidence that you’re not disciplined or that money is bad or whatever it is. What I mean by that is that your brain naturally, just based on the beliefs that it has, it’s scanning for these things because sometimes, as a coach, I can have somebody believe something so deeply about themselves and in one minute I can explain all the evidence that I have from my perspective, from a different perspective, that proves all of this untrue about this client or about this person, and that’s a huge part of my job. So I promise I’m going to connect this back to spell check. So I was thinking about spell check and I was thinking about how, when we type things, we type really fast – at least I type pretty fast and I get pretty crazy and I spell a bunch of stuff wrong – and how these red squiggly lines show up underneath these words, and I go back and I change them. And I don’t have any story about my – actually, I have a positive story about me. I feel like I’m smart. Like, I’m book smart, but I also feel like I’m smart. Now, ask me the date of when the Civil War happened – girl, I know nothing about that. There are certain things that I’m not smart in and it’s really amazing because sometimes, I make up words and say crazy stuff or I sound like I can’t speak, which is really funny. But it really is true. But I have a story that I’m smart, and so it’s not more evidence. And when these red squiggly lines show up, they’re not evidence that I don’t know how to spell and I’m not a smart person. They’re just totally neutral and I don’t even think anything of it. in my head, maybe I’m like, thank you, spell check, because so many things would be spelled wrong if it wasn’t for you. But what I realize is, I don’t think there’s many people who, when there’s red squiggly lines, they think, like, oh my gosh, this is evidence that I’m dumb. It’s just something they go back and they fix and they change. But if you did have a story that you were dumb or that it meant something like your worthiness was based on how smart you were, if somebody said something like, “Oh you don’t know what that word means?” Let’s just say it was a big vocabulary word or something like that, that would become potential evidence to support this belief that you have that you’re dumb or that you’re not smart. And if you’re saying that about yourself, I hope you can work on changing that. I don’t even like to say that out loud. That’s such a mean thing to say. But what I’m saying is, your spell check could be evidence of that. But most of the time, we don’t see it as that; it’s just like a neutral thing. And so I was thinking about how all day, every day, our mind is doing this and scanning and creating evidence to support both the positive and negative beliefs we have about ourselves and the world and how, if we chose to look at things as though it was spell check, or if we just chose to look at things from a neutral place, like when your mom says something to you or your brother or significant other, anything like that, from a place of this is just feedback, just like spell check. This is just feedback and I get to make it mean whatever I choose to make it mean. And this is the power of our minds because, over time, the more evidence we see, the more it builds on this belief and it feels very, very true. And I always joke with people that it’s part of my job to help people hijack their minds because if you keep believing these things that aren’t serving you to show up in life and business the way that you want, you will keep creating the same results. You will keep creating the relationships that you’ve always had or attracting the same types of guys. You will keep creating a certain level of results in your business. And it’s literally your job to start to change, what do I need to believe in order to get to the next level? What do I need my mind looking for evidence for? What do I need to believe about money, life, myself that really serves me? You get to decide. And it’s something that can be very challenging at first because the stuff that you guys believe about yourselves and other people and the world and your business and all of it, it feels very true. But something that I always ask my clients, when they’re very stuck in believing something to be so 100% true is, does it serve you to believe that? And if it doesn’t serve your greatest life, your next level, the person that you want to become, now you have an assignment. Now you have a job to go to work to change it, to really start to shift out of it, to look at the feedback you’re taking in and work on shifting your perspective and saying, what else could this mean? What else could this squiggly red line mean under this word other than the fact that I’m dumb? Oh, I work so fast because I’m so inspired that I spell a bunch of stuff wrong? That’s the thought I have. What could it mean that my client said this or that my boyfriend or significant other said this, instead of it meaning something terrible about me? Could it just mean that they just said something that was totally neutral and I just perceived it that way? That’s your job and that’s how you make your mind your greatest asset. So I want to challenge you guys to go out in the world and look at the feedback you get, look at the evidence that you have in your life as a red squiggly line, and pay attention to how you’re receiving it and how you’re interpreting it and then work on changing the story that you have about it, because that’s how you change your life. I come up with the craziest examples. Anyway, I love you guys. I hope you have an amazing week and I will talk to you next week, bye.